Idaho Falls obstetrician and gynecologist, Dr. Matt Robison takes great pride working with women’s health care concerns and enjoys the many challenges that women face, specifically high risk pregnancy, minimally invasive surgery, and in-office procedures. The in-office procedures Dr. Robison performs include permanent contraception, endometrial ablation, and hysteroscopy to name a few. Dr. Robison’s training as an osteopathic physician brings yet another approach for women’s health care at Rosemark. Osteopathic physicians focus on the “whole person” instead of solely treating symptoms. An osteopathic physician considers the body as an integrated whole — mind, body and spirit. Dr. Robison’s osteopathic education is extremely beneficial to women as additional musculoskeletal training provides unique understanding of how a woman’s body reacts throughout a pregnancy. Also, osteopathic training provides an insightful view as a woman matures and enters into menopause. 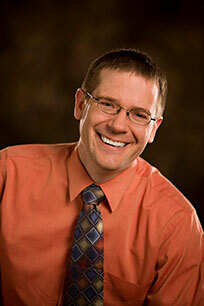 Dr. Matthew Robison is the oldest of seven boys and was raised in Newark, Delaware. He started his college education at BYU Idaho but accepted the opportunity to serve an LDS mission in Bahia Blanca, Argentina. Along with his missionary efforts, he learned and became proficient in conversational Spanish. He returned from Argentina and finished his undergraduate education at University of Idaho. He completed Medical School at Kirksville College of Osteopathic Medicine, in Kirksville, Missouri. After medical school, he did almost two years of Internal Medicine residency until he finally found his true calling Obstetrics and Gynecology. He then pursued and completed a residency in at Genesys Regional Medical Center in Grand Blanc, Michigan. Dr. Robison met his dear wife Denise while attending BYU Idaho and after supporting him through his medical training, she was excited to move back home to South Eastern Idaho. They have one girl and two boys. Dr. Robison’s interests include spending time with family. Together they enjoy bow hunting, fishing, mountain biking, skateboarding, snowboarding and playing ice hockey.